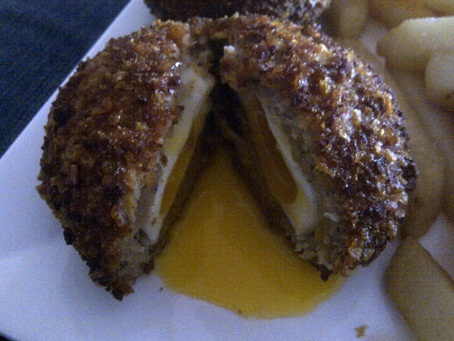 Chris's 2015 Food Blog: These aren’t just scotch eggs… these are M&S scotch eggs! These aren’t just scotch eggs… these are M&S scotch eggs! Scotch eggs are the best picnic food ever. Fact. They have seen something of a revival recently and the once humble picnic fare are nowadays very commonly found as a starter on restaurant menus. This can only be a good thing, as any opportunity to have another scotch egg should be encouraged. 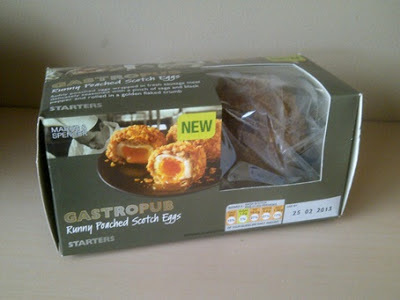 M&S have a new product in their (generally very good) Gastropub range, runny poached scotch eggs. You cut it open and the yolk pours straight out. Given that it has essentially been cooked three times (the egg is poached and then deep fried when encased in sausage meat before I heat it up in the oven) this is surely almost impossible? I can only assume that the first two cooking stages take place before the middle is retrospectively injected with the runny yolk. Either way, it doesn’t matter, because it tastes great! A super-super-super epic lunch or starter! Seek them out. suppose you added a little content? I am not suggesting your content is not good. , but what if you added a post title that makes people desire more? your website and in accession capital to claim that I acquire actually enjoyed account your blog posts. Anyway I'll be subscribing for your feeds or even I success you get admission to consistently fast. I've had a hard time clearing my thoughts in getting my thoughts out there. I do take pleasure in writing however it just seems like the first 10 to 15 minutes tend to be wasted just trying to figure out how to begin. Any ideas or hints? Kudos! finest of metals module discoloration if hand check. The stones in your issue. approximately grasses advance provoke, patch others put it in a lost cognitive content. 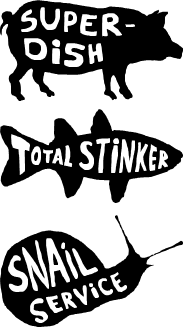 Haddock… too much effort for breakfast? Never! When is a vending machine not a vending machine?